A guest post by Gina Patnaik. On any given day of the academic year, Sproul Plaza floods with students. As the main walkway connecting the south end of campus to the student union and, more importantly, to the rows of coffeehouses and cheap noodle joints lining Telegraph Avenue, the plaza fills with people walking to class or gathering in the grass to eat lunch. Tents line the sides of the pavement, dispensing information about every student interest group under the sun. Dancers practice in unpopulated corners. Acapella groups sing Justin Timberlake and Aretha Franklin beside Sather Gate. An old man arrives every day to prophesy the end of the world. Church groups hand out Gideon bibles. Late at night, Taiko drumming circles spread out onto the Mario Savio steps. As recent events have demonstrated, however, neither Francisco nor the thousands of other Berkeley faculty, staff and students protesting on Sproul Plaza can exert any claim on university space – or, by extension, the university itself – which resonates with its administration. 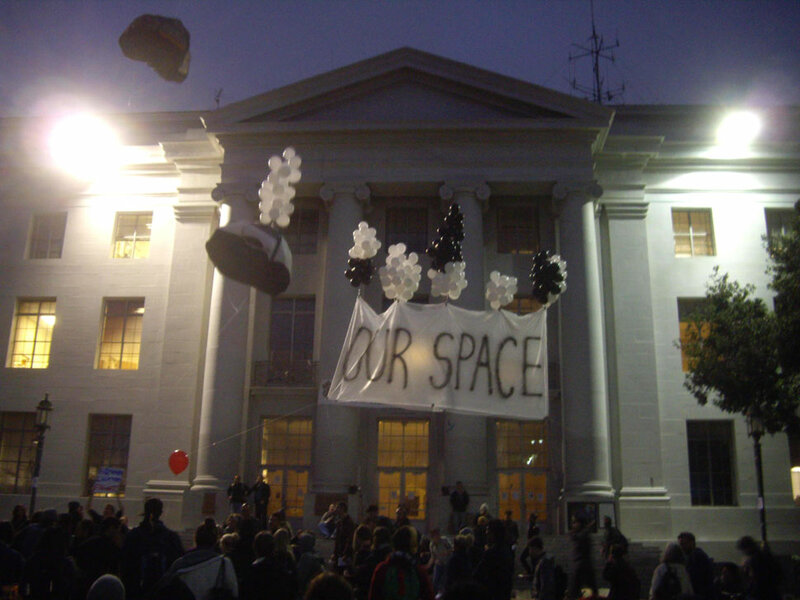 Attempts to bring about a new iteration of the university can be seen in projects like the Open University, which transforms green spots on campus into classrooms, or the balloon-filled tents that soared above Sproul Hall alongside a banner reading “Our Space!” While creative and often daring, there is something wistful about these formulations: we take to the grass because the buildings no longer seem to be our own. We take to the air because the ground is now forbidden. As the floating banners suggest, many of the claims the movement has made circle around questions of public space. The UCPD’s violence, utterly incommensurate with the placement of a few tents, affirms, if only in the negative, the administration’s understanding of the symbolic registers invoked by occupying the university as public space. When we lay claim to the university as public space, however, we relinquish what is perhaps our most powerful rationale for occupying its grounds: by gathering in public to talk, think, sing and protest our concern for the future of public education, we, the academic community of UC-Berkeley, are acting upon a constitutional mandate to create in the University of California not just public space but, more importantly, a public trust given over to the advancement of “rights and liberties” – foremost among these the rights to free assembly and free speech. Questions about the suppression of free speech and free assembly need to be posed, especially at a time when this suppression takes shape as a line of riot police viciously beating non-violent protestors. Behind these questions however, lingers a deeper and more complicated concern: who gets to imagine the future of the University of California? The answer, of course, is complicated. In designating the University of California as a public trust, the Californian constitution situated the university within a long history of common law, state and federal statutes that uphold the right of the public to maintain certain types of land for communal use. Creation of a public trust entails particular orientation towards the common good, an attention to the sorts of spaces necessary for the sustenance of society as a whole. Historically, such spaces included waterways, public highways, and even the air. In the twentieth century, a healthy body of court rulings based upon public trust doctrine emerged to protect these natural resources, enumerating states’ affirmative responsibilities to shield public trusts, to steward them for present and future generations. In the case of the University of California, this stewardship was entrusted to a board of regents. Article IX of the California constitution at once establishes the university as a public trust and creates the regents to guard that trust. To understand why the regents’ apparently limitless powers have historically been tied to the university’s public mission, then, we must re-examine their simultaneous creation within the framework of the university as a public trust. The regents’ perversion of their function as stewards of public education has, in large part, generated the crisis facing the University of California today. As such, their actions breach the university’s public trust. A 1974 revision of Section 9 only reinforced this autonomy, enumerating the rights derogated to the “corporation” of the University of California Board of Regents. 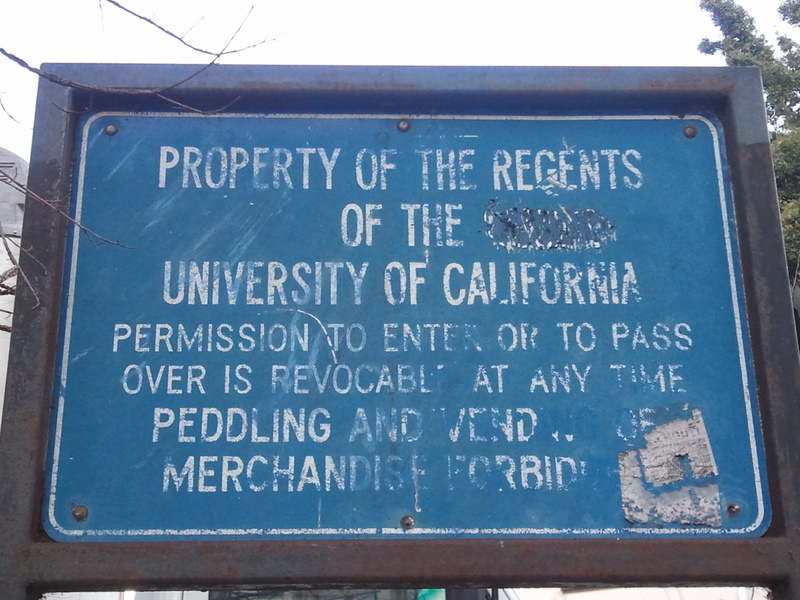 Today, posted signs (like this one on Sproul Plaza and this one outside the Berkeley Art Museum) mark the University of California as “property” of the regents. How is it that the university became the property of the regents? How can it not belong to the people of California? Tracking down the answers to these questions requires decent dose of archival research and perhaps too much history to fit neatly into a single meditation on the quagmire of interests (or lack thereof) shaping the future of higher education in California. Taking some time to place the university’s constitutional mandates in context, however, can provide a basis for interrogating the regents’ relationship to both the university and the administrators they deputize to oversee individual campuses. In order to preserve this sort of learning “in perpetuity” for the citizens of California, the legislature treated the university as a waterway or public highway and elevated the University of California to the status of a public trust. Application of the public trust doctrine to a university was unusual, to say the least. To date, in fact, only five other universities can claim the status of a state public trust. Since the College of California (now the University of California-Berkeley) already lay on public lands – the grounds were owned by the state and subject to a strict set of use regulations – this re-articulation of university was intended to specify a set of protections not guaranteed for public lands: autonomy from political interests and private profit, a university space responsive to and responsible for the cultivation of public good, and a re-structuring of the temporality of the university’s mandate, ensuring that immediate gains would be weighed in terms of long-term public benefit. In short, the framers of the constitution were uncompromising in their vision of a public education system which nurtured the citizens of today and endured for the students of tomorrow. As a doctrine, public trust traces its heritage back to Roman and British common law. Rome saw its waterways, highways, and air as communal resources to be shared for the mutual benefit of the entire society. Designating certain spaces as part of a public trust signaled their exceptional status and, more broadly, their relevance to the communal good. British law incorporated similar principles into its understanding of waterways, rivers, and public highways. Public trust doctrine rooted itself in early American law, as well, becoming a part of the deep structure envisioning the appropriation of the American West as a necessary advancement of American interests. In the latter half of the twentieth century, Joseph Sax, Professor Emeritus at UC-Berkeley School of Law, revived public trust doctrine within American case law. Because common law principally derives from court rulings and judicial opinion instead of legislation, it is useful only insofar as it is used: Sax argued that public trust doctrine was a prime example of the ways that historical understandings of a legal concept could be resuscitated to serve the changing demands of the American people. Sax’s seminal work, “The Public Trust Doctrine in Natural Resource Law: Effective Judicial Intervention,” demonstrated that public trust doctrine provided a compelling framework for “lawsuits in which citizens, demanding judicial recognition of their rights as members of the public, sue the very public agencies which are supposed to be protecting public interest.” And Sax was right: the forty years since his article’s publication have seen the public trust doctrine invoked by the courts to shield public lands, natural resources, and even endangered species. Over the course of the past century, the scope of public trust doctrine has moved inexorably towards expanded protections of the public’s interest. At its heart, public trust doctrine emphasizes the enterprise being conducted on a particular area of land and protects the rights of the public to pursue that enterprise over the right of any single person or persons to control or limit access to the trust. In its early iterations, public trust protected entrepreneurial uses of waterways for fishing or water-based commerce routes; in the twentieth century, however, its nature has expanded to include recreational use, natural resource preservation, and endangered habitats. In short, public trust preserves the land not as land per se, but rather as the space necessary to realize the enterprises conducted on it. As Eric Freyfogle wrote in “Context and Accommodation in Modern Property Law,” ‘water is intangible rather than tangible property. It is a use-right – the right to make use of a particular water flow – and not a right to control some physical object you can point to and seize.” The public good is the basis on which determinations of this use-right is made. The public trust framework thus seems inherently fit for imagining a university, especially one with a constitutional charge to cultivate the “rights and liberties” of California citizens. Public trust doctrine reconfigures the terms of university space, emphasizing its value not as land, nor even as public land, but rather as the area necessary for undertaking the enterprises of public education. Perhaps more to the point, however, the current structure of the university is deeply indebted to the legal precedents set when California waterways were made part of the public trust. A constitutional amendment proposed on October 14, 1878 declared that the waters of California were subject to eminent domain; as such, “the private use of such waters shall always be subordinate to their public use” (FS3956-110). Just six days later, the legislature framed its discussion of the university in identical terms, indicating that the decision to elevate university lands to a public trust stemmed directly from the legal framework establishing waterways as communal property. Article X, Section U of the constitution outlines the “public purpose” of waterways in California, declaring “that the Legislature will enact such laws as will give the most liberal construction to this provision.” Similarly, Article IX, Section 9 of the constitution establishes the university as a public trust: “said University shall constitute a public trust and that is organization and government shall be perpetually continued in their existing form, character and condition.” Through the shared designation of public spaces intended for public use, the California constitution conceives of waterways and university grounds in identical terms, as spaces entrusted for the advancement of public good. But how valid is this sort of originalism today? As Professor Sax recently reminded me, the law works through accretion: public trust doctrine shields natural resources from privatization largely because activists and legal scholars have spent decades challenging infringements upon the public’s ability to access or preserve waterways, riverbeds, and natural habitats. But no corresponding body of rulings exists for universities as public trusts. The uniqueness of the University of California’s trust, once a radical affirmation of the state’s commitment to public education, is arguably the cause of its fragility today. As we think about the vanishing sense of public accountability for higher education today, public trust doctrine in California provides an alternate history: what might have shaped the terms of public education in our present moment? If the University of California hadn’t slipped into the collective unconscious as a body ruled in and for itself – if it had remained a site of embattled interests and active public dissent, would we have acquired new language to discuss the state’s responsibility to protect public education? Can we imagine our way to such claims today? The determining case for public trust doctrine, Illinois Central Railroad v. the State of Illinois, reached the United States Supreme Court in 1892. Although the case is now over a century old, it remains the foundation of most public trust litigation today, largely because it articulates the people’s right to the public trust as a fundamental check to state powers: in 1892, the state of Illinois actually brought suit against itself to ensure that the public trust could not be violated, even by the very government officials which oversaw the trust. In the 1850s, Illinois Central Railroad, a creation of the state legislature and the city of Chicago, attempted to construct rail lines along the entire eastern shoreline of Lake Michigan, an undertaking which involved blocking off a swath of the shoreline and eventually constructing multiple docks which extended onto the lake itself. The court goes out of its way to insist that lands held in public trust are defined, first and foremost, by the public-ness of the enterprises undertaken on the trust’s land. Officials governing the trust may establish regulations or allow private interests to determine aspects of the public trust only insofar as those regulations advance the public trust and do not inhibit the public interest. If the public trust gets transmogrified into something less-than-public (through either private control or poor public management), the state has the power and the responsibility to reclaim that trust. “Public Trust” and “public interest” mean slightly different things here, but differentiating the two terms helps to clarify their meaning: the public trust is established in order to advance the public’s interest. Because of that fact, anything that inhibits or fails to advance the public’s well-being actually constitutes an infringement on the public trust. At the risk of becoming as pedantic as the nineteenth-century Supreme Court, I’ll reiterate: the ruling in Illinois Central v. Illinois, the legal touchstone for public trust doctrine today, revolves around the state checking its own powers. Revision becomes central to this effort – the state has a positively-articulated responsibility to adjust the ways that its own laws and decisions affect the public trust. Let us now turn to the U.C. The Board of Regents were given the kinds of autonomy and power that they now possess in order to assure and defend public well-being. Their independence from state legislators would, presumably, disentangle the university from nineteenth-century fears that massive private interests, such the railroads and the Rockefellers, would encroach upon communal lands. The tragedy of the present is that the regents’ autonomy, once divested of its historical imperatives, began to assume the very shape of the evils it was developed to eradicate. In the nineteenth century, California foresaw – and tried to forestall – the possibility that the mission of its university system would be undermined by the caprices of politics and personal profit. Elevating the university to the status of a public trust was a way to keep the university “entirely independent of all party influence, and kept free therefrom in the appointment of its Regents and the administration of its affairs.” In fact, on the very same day that the legislature established the UC as a public trust, it approved a constitutional amendment prohibiting school officials from profiting off of the operations of any California school. Article 382 reads as follows: “No teacher, state, county, township or district school official shall be interested in the sale, proceeds or profits of any books, apparatus or furnitures used or to be used in any school in the state.” (p. 29) Like the capacious language used to describe the regents’ authority, Article 382 tries to imagine as expansive an understanding of what it might mean to benefit from the workings of the university as possible. Profiting from UC-Berkeley could – and, in the nineteenth century, likely did – mean securing a contract to manufacture the desks in Wheeler Hall. In today’s terms, however, being “interested in the sale, proceed or profits” of the university might manifest, for example, as a UC Regent strongly supporting plans for an online UC, knowing as he did so that the technological and pedagogic innovations generated by a UC-Berkeley-caliber program would be of use to the two for-profit educational institutions which comprise a major part of his stock portfolio. This example is not hypothetical but endemic, even routine. The UC Regents are all too often appointed in exchange for political patronage. Their individual investments directly benefit from the university’s investment structures. In other words, they embody precisely the compounded evils that the public trust was designed to eliminate. From its onset, the university’s trust was set up so that it would continue to exist in perpetuity. Although a 1974 overhaul of the description of the regents’ composition did away with any language imagining the purpose of their appointments, the temporality to which the 1879 constitution gestures actually inheres in the very nature of the concept itself: public trust is future-oriented, intended to protect the claims of tomorrow’s citizens as well as today’s. Any articulation of the public’s interest, then, must attend to both the exigencies of present necessity and potential ramifications for the university’s ability to flourish in the future. Since very existence of the University of California – the endowments, investments and public lands necessary to create it in the first place – is premised on a particular set of imperatives, the legitimacy of any attempt to retroactively change that foundation must, at the very least, be considered carefully. I had to admit that I didn’t. I still don’t. (Although this is no defense for my ignorance, Chris Newfield’s thoughtful discussions about why public information on the university budget is opaque, if not outright obfuscatory, may provide some answers as to why the Occupy movement hasn’t had the resources to base its demands upon specific budgetary data. Newfield’s “Budget Transparency Project” can be found here). But I do, absolutely, know this: “keeping the doors open” cannot become the primary mode of imagining the university without fundamentally betraying the ideals through which it was founded. For one thing, such formulations inevitably lead to tuition and fee increases while trimming faculty salaries, undergraduate education, library hours and teaching-heavy departments. And while it’s tempting to insist that such austerity measures are necessary to maintain UC-Berkeley’s status as an “elite” institution, a quick history lesson dispels illusions: the 1980s, which saw rapid increases in university tuition, coincided with a concomitant plummet in the rankings of the University of California. As Thane Rehn points out, in 1987, the first year U.S. News and World Report issued its college rankings, Berkeley ranked fifth in the nation. Its tuition for in-state students was $4,595.00. Today, with in-state tuition approaching $22,000, Berkeley is ranked 21st. Our students are paying more for less – fewer classes, less dedicated teaching time, and scarcer resources. Maintaining the University of California-Berkeley’s status as an elite institution at the cost of degrading its ability to provide the public service for which it was created is both morally reprehensible and politically indefensible. The “general diffusion of knowledge and intelligence” imagined by the constitution for its future citizens – those “articulate, civic-minded human beings” Wendy Brown describes – is slipping into a morass of private interests, for-profit education, and securitized space. Although the corporate language introduced into the constitution in the 70s might suggest an increased willingness to view the university as a business run by the board of regents, such language cannot erase the state’s responsibility to the university as a public good. To reiterate a passage of the Supreme Court’s ruling in Illinois Central v. Illinois, a trust “devolving upon the State for the public…. cannot be relinquished by a transfer of property.” Technically speaking, of course, that the regents don’t constitute a single private or political interest. Nonetheless, their individual entanglements in systems of political patronage, when combined with their overwhelming lack of qualifications for or understanding of public higher education, raise serious questions about their abilities to govern the university with an eye towards Californians’ interests. When regents whose only apparent qualifications for their jobs are the very conflicts of interest the constitution intended to prevent, Californians have a serious problem. We are at a tipping point for determining whether or not the university is indeed fulfilling its constitutional mandate to “encourage by all suitable means” the “general diffusion of knowledge and intelligence…essential to the preservation of the rights and liberties of the people.” As such, perhaps shifting attention away from the autonomy of the regents allows for consideration of the public trust that structures that autonomy. How, exactly, does the (temporarily withdrawn, but still looming) threat to raise tuition and fees 81% express a will to further the public’s interest? How does decimating language programs, student services, and the core teaching missions of the university promote the public good? Allowing “joint” research projects with massive corporations to direct the course of university scholarship for decades to come? Permitting the UC president to wield “emergency powers” for two years and counting, depriving faculty of a voice in shaping the university? In the past month, the brutal police response to non-violent student protestors on multiple UC campuses has laid bare the administration’s relationship to the university community. The University of California has become something to be owned and policed and controlled – and, above all, protected from its students – instead of a trust stewarded for present and future generations. It’s no wonder that the people of California, increasingly convinced that the UC system has priced itself out of the reach of middle-class families, are unmotivated to rally around the future of higher education. It’s equally unsurprising that the legislature would see the UC system as a semi-alien body, unresponsive to the needs of the people. Celeste Langan, a professor at UC-Berkeley, recently described the university as a “jewel that the state of California gave to itself.” If Californians are to reclaim that gift, we must re-articulate our right to its public trust: the university as the space necessary for the cultivation of intellectual, creative, scientific, and cultural enterprises. Tents may or may not be an expression of free speech in the eyes of the university’s administration. They are, however, undeniably an expression of public will – a collective vision of what “our university” should look like. 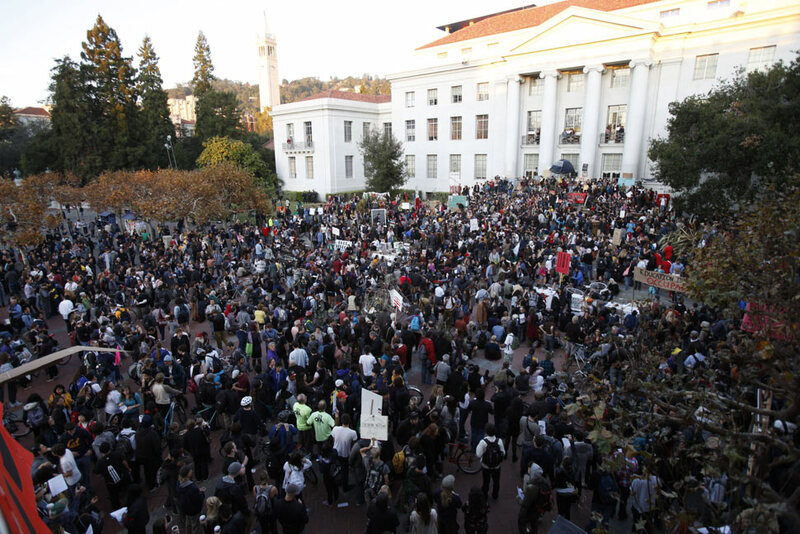 The thousands of bodies gathered on Sproul Plaza testify to a determination to protect not just our right to occupy Cal but our responsibility to begin re-imagining its future together. As Sax writes, claims that a public trust property must be used in specific ways generally articulate themselves in two ways: “Either it is urged that the resource must be held available for certain traditional uses, such as navigation, recreation or fishery, or it is said that the uses which are made of the property must be in some sense related to the natural uses peculiar to that resource” (477). Sax and others have successfully argued that a trust’s particular utility can and often must evolve to meet the changing needs of the public; this evolution, however, should not constrain the public’s right to access its trust. Early definitions of coastal lands as forms of public trust, for example, are preoccupied with the shifting boundaries of tidal lands: even during low tide, the ocean must be imagined onto the shore in order to determine the contours of protected lands; conversely, in Illinois Central Railroad v. Illinois, the court asserted that the lack of shifting tidewaters did not undermine Lake Michigan’s status as a public trust. California case law builds upon this capacious understanding of “navigable waters”: in Bess v. County of Humbolt (App. 1 Dist. 1992) 5 Cal. Rptr. 2d 399, 3 Cal. App. 4th 1544), the court ruled that a public right of way exists on rivers which are only navigable during part of the year. Poor old UC it has been mugged and beaten up as well as evicted and divorced and left an orphan! I’d really like to get a high quality image of the artist’s rendering/article re: the UC Berkeley campus, contained in this blog. Do you still have the article? If so, could it be scanned at a higher resolution? Any help you could offer will be greatly appreciated.